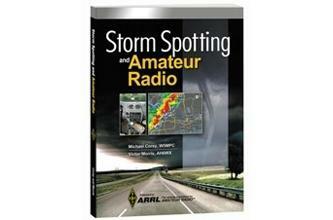 Amateur Radio: Your opportunity to participate in severe weather reporting. SKYWARN®, a program of the National Weather Service, includes thousands of volunteer storm spotters who serve as a first line of defense against severe weather. Amateur Radio operators bring to storm spotting great resources; an established communications system that can function in an emergency, a pool of volunteers willing to be trained, a history of public service, and technologies that no other group has. o Memorandum of Understanding between the National Weather Service and the American Radio Relay League, Inc.
Storm Spotting and Amateur Radio is available from ARRL and publication dealers near you.